Companionship can sometimes take strange forms. In Flavio Alves' short film The Secret Friend, we are introduced to a lonely old woman (Viola Harris) who recently lost her husband. A neighbor (Siobhan Fallon) stops by to express concern for the recently widowed elder, but from her uncomfortable demeanor it seems unlikely she'll be making any return visits. In the absence of human contact, the old woman has only her house plants to talk to. 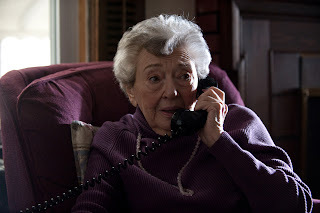 When she starts getting what seem to be prank calls, the old woman is angry at first. Soon, however, she finds herself reaching out to the silent listener on the other end of the line. The Secret Friend is a pleasant, well made fifteen minute riff on the need for human contact, and the lengths people will go to find it. It manages to achieve pathos without being sacharine, and pulls off its twist ending without seeming too cutesy or trite. This is the kind of thing a short film, like a short story, can do very well. Try to stretch it out into a feature, and it would feel padded and lose its impact. Unfortunately short films rarely get seen outside of film festivals. The Secret Friend played this year's Cleveland International Film Festival back in March. Those living in more westward environs or willing to make the drive will have another chance to see it on October 17th at the Toledo-Lucas County Public Library. 3 out of 4 stars.